FREE Cavallo 3-Piece Gift Pack Manicure Set, Visor and All-Purpose Knife with purchase of select Cavallo Boots and Saddle Pads! $54.95 Value! While Supplies Last! Cavallo Sport Regular Sole Hoof Boots are simple front-fastening with industrial grade Velcro® closures. They are simple to put on and take off, and stay securely on-hoof. They are shaped for the natural hoof with a moulded-in back flap for bulb protection and abrasion resistance. Durably constructed with a waterproof tread, rustproof metal, and high-performance TPU outsole, they are lightweight and have built-in drainage. Healthy hooves are promoted by allowing expansion and contraction, and increased blood circulation. See measuring and sizing info at right. Work really well when riding. They are easy to fit, easy to put on, and stay secure the whole time. They help my newly barefoot tb to move like he does in shoes. I even jump with them. I really love these! I've only been using them for a few weeks. They are much easier to put on and take off than the other style of Cavello boots i have. We'll have to see how long it takes for these to wear. I use them every time i ride. I have tried several different brands of hoof boots but now use only Cavallo boots. The price is good and they are easy to put on. They also seem to hold up well. These boots are lifesavers! My mare has deep central sulcus thrush this winter and I have been out in the snow and blistering cold wrapping and soaking her feet for the last 3 weeks with 2-3 more weeks likely to go. These boots do a fantastic job of keeping her hooves clean and dry and protecting her hoof wrap from wearing out before I can get back to the barn to change it. They have made comfortable turnout possible. They have a snug excellent fit with no rubbing. So tough and so light on her feet. This product has allowed me to be able to ride my horse without his special wedge shoes. The boots provide cushion and traction without inhibiting his natural movement. They are durable and fit exactly as measurements suggested. They are very easy to put on and take off. I highly recommend them. This is a great boot! Always have loved the previous Cavallo simple boots and these are even better. They are much quieter and the clasps keep them closed better than just the velcro before. These boots work great! Have used these boots before,worked great .Buying these because my other ones are woren out. Love these boots ,easy to put on and take off.Have used other boots and they were very hard to get on.Great product. I used to use Cavallo boots 10 years ago & never had any problems. Switching boot brands to see if my mare will keep these on. Is this all 4 boots? BEST ANSWER: The product include 2 boots only. Horses typically wear different sizes on front & rear hooves, the rears being generally smaller, though my Arab wears "ones" all around -- regular width on fronts & narrow on rears. This style is my favorite of what Cavallo offers. Like the side snap closure as it holds up well in rugged trail riding. BEST ANSWER: On the right side of the Product summary is the boot measuring chart and Cavallo measuring guide. Once you measure and find out what your horse needs, then you can order appropriate size. Good luck, those are great boots. The size is on the left side of the price list. Numbers 1-4. They are all the same price, you just need to select the correct size by clicking on the box next to the correct size number. This boot is available in sizes 1-4. Click the size you need and then click add to cart. There is a size measuring chart. The numbers 1- 4 correspond to the size. BEST ANSWER: My husband & I have used all styles of the Cavallo boots with the Sport Boot being our favorite choice due side button snap closure outlasting the others. If you size the boot correctly to the horse's hooves, nothing more is needed. We tried the gel insert, but it created uncomfortable pressure to the hoof. If you take your time to allow the horse's heel buds to toughen so there is not abrasion, there should be no problem, but go slow on that part. We always put new boots on our horses for a few hours a day just to break them in, but the heels need to build up a callus, too. The Sport Boot now is offered in both normal & narrow widths, making it easier to get a good fit. It is not uncommon to get the wrong fit with your first attempt, so put a plastic bag over the hoof when you try it on so you can exchange it if necessary. Also make sure your horse's hooves are trimmed. If the boot can be twisted from side to side, it's too big. Good luck! I have seen people use Vetrap to customize the fit, but ideally you would not need anything underneath the boots. 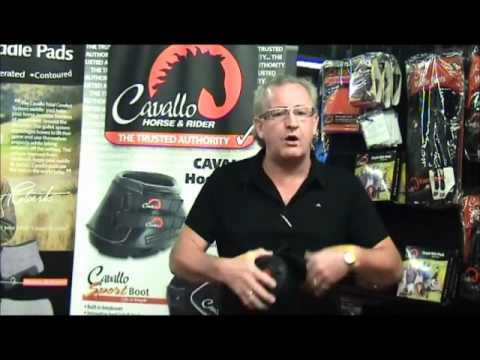 Cavallo does recommend to condition a horse to hoof boots gradually to prevent any soreness/rubbing and to get familiar with putting them on correctly. The boots come up to the ankle on the horse not sure that you would get bell boots on them. They cover the bulbs of the horses foot so I would say you don't need bell boots. I like mine and don't use shoes on the horses any more. is this style OK for hoof that is wide? BEST ANSWER: My horse wears a size3 shoe. He does not have a wide foot but a normal proportioned hoof. I did order a size up for him. I ordered them so when he threw a shoe, I had a way to protect hid hoof and not break down. Low and behold, he threw a shoe , I put the boot on and remarkably it stayed on for over a week, it did not rub and the hoof was perfect when it came time to reset him. First time ever that happened! I LOVE them. Highly recommend them. Yes, this is the style for regular/wide hoofs (there is also a slim version of this boot). There is a video on Cavallo's website that shows how to measure for size - I recommend viewing it as I goofed my measurement on the first try and had to re-order after being properly educated... Good Luck and happy riding! No. I should have bought a size up. My horses feet are necessarily wide, I would say regular. Someone says that they sell half sizes. I waited to long to be able to return them, otherwise I like them a lot. I am not sure! My horse has average size hooves. It worked great on my horse with a wider foot. BEST ANSWER: I use them on my mare that has founder issues and they help a bunch I also put the pink pad in them. As for a navicular horse they would keep them from getting stone bruised I would say. If the horse has been nerved I would most likely use them just because once nerved they can't feel the hoof any more. So would help protect their hoof soles. Yes! My mare has navicular disease, and needs eggbar shoes and pads. When she throws a shoe sheâ€™s very obviously ouchy on the driveway, but is totally comfortable - and rideable! - with this boot on. I feel no change in her gait whatsoever. An excellent product!! While I have never had a horse diagnosed with navicular syndrome I do think these boots might help make them a little more comfortable by reducing some of the concussion from the hoof hitting the hard ground. As Veterinarian, I say yes! You can even put more cushion in the sole, although the pads don't last as long! to me a rubber contact with ground forces is less damaging than a metal contact. I would think so - since I assume it means you are going barefoot. But - I am no expert. Hope it helps! I'm not sure. Might be a question for your ferrier or vet. What size would you get if your horse measures exactly between a 1 and a 2?? Cavallo highly recommends that you measure in millimeters instead of inches. One of the easiest ways to measure is stand the horse on heavy paper on non-corrugated cardboard and trace closely around the hoof. If you are still between sizes, it's usually best to size up. I originally bought the larger size for for my horse because he also measured between sizes. They were a bit too big. You can send them back if they don't fit... be sure they not dirty. It's a tricky process buy boots on-line. I think I'd order up b/c of natural hoof growth. If you measure soon after a trim then go 7 + weeks between trims the hoof will have grown. I'd also ask a rep their opinion. 1 1/2. Size one is very hard to get on, but size 2 is too big. Will they keep the hoof dry when turned out in wet weather? Can they be used with shoes? BEST ANSWER: They won't keep the foot dry - there are holes which enable water to run through while riding your horse in water. I have never used a boot while having a shoe on a horse since they are designed for a barefoot horse to help his feet from getting sore. They work great for that! Easy to put on, stay on and keep their feet from getting too tender. Carry a pair with me on every ride whether I need them or not. Hope this helps! hi Kacilyn! great questions! no, the boots will not keep the hooves dry. they are mainly used as a short-term solution to protect the tender soles when riding on rocky footing. if your horse already has shoes, then I wouldn't think you would use boots also as they serve the same purpose, just different options. hope this info helps to answer your questions! No I would say they would keep the hoof dry. There are drainage holes on the sides which you can see in the picture. They are to take the place of shoes not sure why one would want to do both and don't know if it would work. there are open slots on the lower edge of the boots so water can drain out of boots. As far as walking in wet grass and such I would say they are not going to be totally dry. My answer should read no, I would say they would NOT keep the hoof dry. Etc. Are your boots sold as a pair or individually? BEST ANSWER: When I bought them they came as a pair. I really like these brand of boots. I use them for trail riding and when I have a foot issue. Good boots quality, and they stay on. What size should I get for my horse? I've measured her hoof 4 1/2 inches across and 4 inches from the back to toe. BEST ANSWER: Please call our Customer Care team for assistance. We are available 8AM-8PM weekdays, Eastern time at 888-809-0751, or you are welcome to email using the Customer Service link at the bottom of our web pages. How do these work on rocky terrain? We have lots of loose shale on trails around here. Need something that won't slip. BEST ANSWER: I would say they don't slip. I am disappointed in the length of the elastic attached to the valcro, when attached to the tightest hole, it still is loose. as if the elastic was too long. I have a couple sets for a couple different horses and it holds true to the ones that I have. Try looking at the easycare trail boots, there designed differently. And good for terrain. BEST ANSWER: No. They are not built for safety for snow and Ice. They are used for regular terrain and will work as well as metal shoes on snow and Ice. I couldn't get mine to fit correctly on my horse, so, I donated them. I do not know. Nothing is ever good on ice.